O.K, onwards and upwards with the tear planning, I have another of my questions! I only have a very basic understanding of electronics, so I am gonna get my electrician mate in to do all the electrics but I'm still curious! 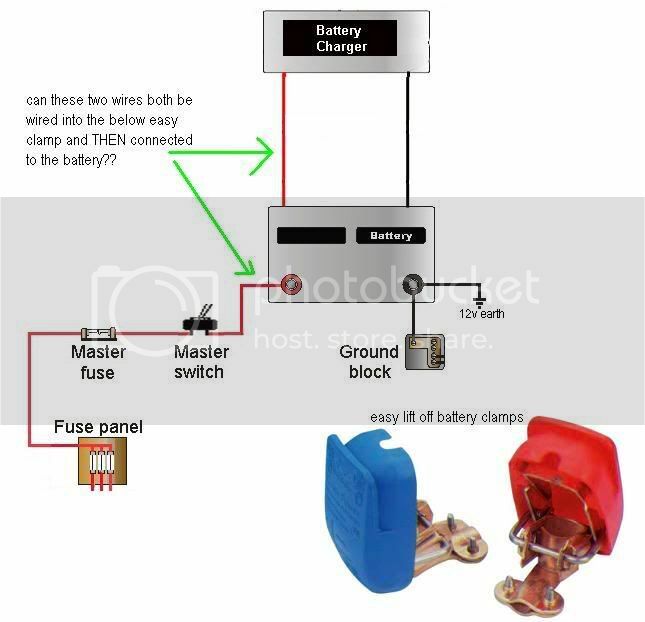 Regarding batteries, can you connect two wires at once to them, for example the charger leads and the wire going to the distribution station/fusebox (see diagram!) If this is possible can these two wires both by put into one of those easy release clamps for the battery? Grounding the 12v, do I do this like a car radio installation and just get it on to a bare piece of metal? (eg chassis) Or do I have to put the wire physically on the ground when I pitch up (like a trailing wire). Most of the other stuff I'm okay with - wiring up the sockets and lights etc, so maybe if I find the answers to these questions I can do the 12v, and just get him to check it! Not touching the 240v though - I'll leave that to him! Quick thanks to the author of this diagram as well - its very clear and I've fiddled with it to fit in with my plans! Thanks for clearing that up Dale, I just wanted to make sure its o.k to put wires together into that clamp - especially when one is putting energy into the battery whereas the other wire will be taking energy out. Anyone have ideas on the grounding ques??? You want to reverse the fuse and the master switch also. Like battery pulse terminal then the master fuse as close to the battery as possible, then the master on / off switch, then the battery charger and the fuse panel. The master fuse protects the battery if a short in any load or the wiring happens. Why not wire the battery charger into the fuse block and the ground block? Then you only have one wire to corrode at the battery and the charger is fused. You can run all your wires back to the ground bar or screw them into the trailer. 12 volt needs only be grounded to metal not the "earth/ground". Your 240 is best left to a professional whenever possible. Same for the 120vac. Thanks Miriam, I'll put the earth on to bare chassis, and let my electrician mate check all that over when he comes to fit the 240v - I ain't touching that!